DATE/TIME: June 22, 2017	11:00 p.m.
On June 22, 2017 at approximately 11:00 p.m., Deputy Kenneth Bubier observed a Quad being operated on Old Highway 58 in Barstow. Due to the suspicious late hour, Bubier conducted a traffic stop on the Quad and contacted the rider, Jack Lee Ernest. Ernest originally attempted to flee and behaved so suspiciously he was detained. 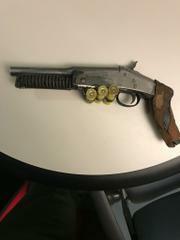 During a pat down search of Mr. Ernest’s person, Bubier located numerous illegal weapons, the most serious and deadly being an illegally sawed-off shotgun, with ammunition tactically attached to it for easy access. Bubier also located illegal “brass knuckles” and two large knives which Ernest had positioned for tactical access. Ernest claimed he fashioned himself as “Mad Max”, a reference to a violent movie involving deadly assaults from vehicles. Bubier arrested Ernest for possession of illegal weapons. Ernest was booked at the Barstow Jail with bail set at $30,000.00. The quad was towed and stored by a local tow company used by the Sheriff's department. Anyone with information regarding this investigation can contact Deputy Kenneth Bubier or Sergeant James Evans at the Barstow Sheriff's Station.